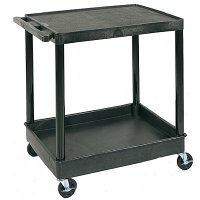 Large two shelf utility cart with top flat shelf and bottom tub shelf. 4" casters, two with locking brake. One 2 3/4" deep tub shelf. Shelf clearance 25". Push handle molded into top shelf. All shelves reinforced with two aluminum bars. 400lb maximum weight capacity. Made of heavy duty molded plastic. Easy assembly with rubber mallet (included). Lifetime warranty.